Sonaimuri Upazila (Noakhali district) area 170.42 sq km, located in between 23°02’ and 23°06’ north latitudes and in between 91°00’ and 91°13’ east longitudes. It is bounded by Monoharganj upazila (Comilla), Begumganj upazila on the south, Senbagh upazila on the east and Chatkhil upazila on the west. Population Total 290846; male 141029, female 149817; Muslim 281365, Hindu 9309, Buddhist 13, Christian 114 and others 45. Water bodies main river: Dakatia. 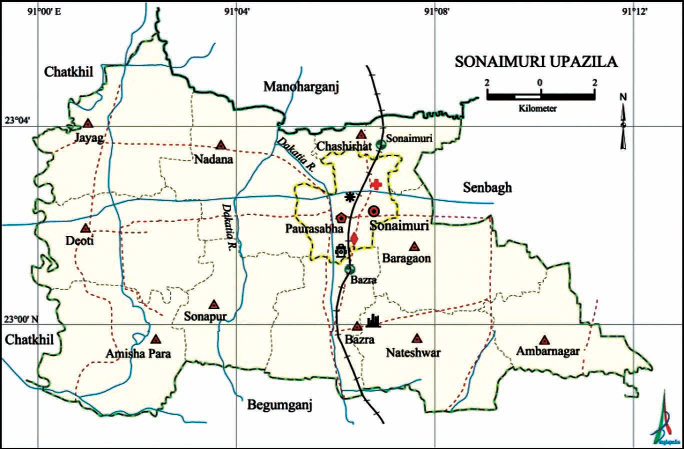 Administration Sonaimuri upazila was formed on 29 January 2005 comprising parts of Begumganj upazila. Archaeological heritage and relics: Bazra Shahi Jami Mosque (1153 AH), Sree Sree Gadadhar Kundu Tirtha (place of pilgrimage). History of the War of Liberation: Sonaimuri upazila was under Sector 2 during the war of liberation. On 21 April, two encounters were held between the freedom fighters and the Pak army, one at a place near the outer signal of’ Sonaimuri railway station and the other at Bagadia in which about 20 Pak soldiers were killed and so were two freedom fighters. This upazila was liberated on 7 December. Marks of the War of Liberation: Memorial monument 1 (Sonaimuri). Religious institutions: Mosque 165, temple 6, tomb 1. Noted religious institutions:’ Bazra Shahi Jami Mosque, Sonaimuri Jami Mosque, Nadana Jami Mosque. Literacy rate and educational institutions: Average literacy 55.77%; male 56.24%, female 55.32%. Educational institutions: college 4, secondary school 33, primary school 114, community primary school 6, madrasa 19. Noted educational institutions: Sonaimuri Degree College (1970), Sonaimuri High School (1917), Bazra Multilateral High School (1919), Sonaimuri Hamidia Aliya Madrasa (1926). Main sources of income: Agriculture 27.32%, non-agricultural labourer 2.06%, industry 0.63%, commerce 16.46%, transport and communication 3.60%, service 18.15%, construction 1.29%, religious service 0.38%, rent and remittance 14.38% and others 15.73%. Ownership of agricultural land: Landowner 60.38%, landless 39.69%. Cultural organizations: Library 2, club 6, women’s organisation 6, playground 12, cultural group 2. Main crops: Paddy, betel nut, mustard seed, pulses, vegetables. Extinct or nearly extinct crops: Linseed, sesame, arahar, china. Main fruits: Mango, jackfruit, coconut, banana, black berry, guava, papaya, betel nut. Communication facilities: Pucca road 96.54 km, mud road 732.39 km. Extinct or nearly extinct traditional transport: Palanquin, horse carriage, buffalo cart. Noted manufactories: Rice mill, ice factory, saw mill, biscuit factory, welding factory. Cottage industries: Goldsmith, blacksmith, pottery, embroidery, wood work, bamboo and cane works. Hats, bazars and fairs: Hats and bazars are 30, fairs 2, most noted of which are Sonaimuri Hat, Thanar Hat, Kamarer Hat, Nadana Hat, Kashimpur Hat, Shantir Hat, Lalmiar Hat, Jayag Bazar, Bazra Station Bazar, Muslimganj Bazar, Sonapur Bazar, Bangla Bazar and Amisha Para Bazar. Access to electricity: All the wards and unions of the upazila are under rural electrification network. However 53.85% of the dwelling households have access to electricity. Sources of drinking water: Tube-well 85.84%, tap 0.64%, pond 7.72% and others 5.80%. Sanitation: 60.89% of dwelling households of the upazila use sanitary latrines and 28.89% of dwelling households use non-sanitary latrines; 10.22% of households do not have latrine facilities. Natural disasters: The floods of 1988, 1998, and 2004 caused heavy damages to settlements, livestock and properties of the upazila. Besides, the tornado of 1993 and the cyclone of September 2006 flowing over six villages of Amisha Para union caused heavy damages to settlements and properties of these villages. Health centres: Hospital 1, upazila health complex 1, health and family welfare centre 10, family planning centre 8, community clinic 24.